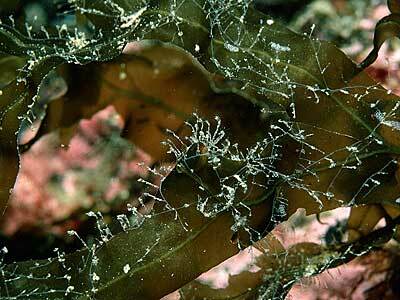 Description: This small inconspicuous hydroid often grows on the stems of other hydroids and on red algae. It resembles bristley hairs that project at right angles to the surface on which they are growing. When examined under the light microscope, there are regular annulations around the base of the stem and below the hydrotheca. The rim of the hydrotheca has a series of deep rounded notches. The stems maybe branched or unbranched and arise from a basal stolon. The gonothecae are very characteristic, they arise from the base of the stolon and are barrel shaped with deep horizontal ridges. Typically 10mm in height. Habitat: Grows on the stems of other hydroids and on red algae. Ecology: The nudibranch Hancockia uncinata is a predator of this hydroid. Distribution: Common on all coasts of the British Isles. Picton, B.E. & Morrow, C.C. (2016). Clytia hemisphaerica (Linnaeus, 1767). [In] Encyclopedia of Marine Life of Britain and Ireland.